Although the Serenity Prayer is well known in recovery circles across the globe, it is still somewhat unknown to most. However, awareness of the Serenity Prayer is undoubtedly growing because it has been mentioned in many TV programmes, documentaries and films. If you are not recovering from an addiction yourself, you may wonder what the fuss is all about. The Serenity Prayer was written back in 1932 by an American Theologian called Reinhold Niebuhr. The Prayer was later adopted by Alcoholics Anonymous in 1941. Today, the Prayer has been adopted by many other 12-step organisations such as Gamblers Anonymous and Narcotics Anonymous. The popularity of this simple prayer is owed to the deep spiritual meaning contained in its words. We shall examine each part of this short prayer below. The very word ‘serenity’ is unarguably archaic, so let’s begin by defining this term. It’s interesting to note that those trapped in the circle of drug and alcohol addiction often feel agitated, anxious and uneasy. Thus, serenity is, emotionally speaking, the polar opposite of the emotional state experienced by those who are addicted to substances or certain behaviours. As discussed above, serenity is akin to calmness. When we lack serenity, we tend to feel stressful and agitated. It’s difficult to make sensible decisions when in this negative state of mind. When we are stressed, we are likely to act impulsively and on our emotions. Doing so can have far-reaching negative consequences. Asking for serenity is a wise decision, particularly when you are about to act in a way that could result in long-term emotional or physical harm. Stress is very much a modern disease that’s linked to a whole range of ailments such as cancer, heart disease, obesity and premature death. 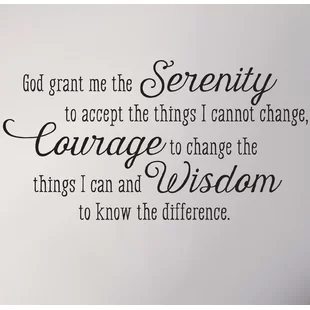 This backdrop means the Serenity Prayer could never be more relevant to the lives of addicts and non-addicts alike. Although accepting the things you cannot change is makes utter logical sense, each and every one of us is guilty of chastising ourselves or obsessing over matters that we are not in any way capable or likely to influence. The word ‘accept’ is also significant because to accept means you are accepting the present moment without resistance of any kind. The word ‘accept’ hints at your emotional ability to bear and even accept hardship that’s not immediately within your power to change. It’s worth mentioning that your ability to accept hardship is aided by practising mindfulness meditation because both support the goal of overcoming negativity and experiencing the present moment as a neutral observer. Attempting to control the uncontrollable is utter madness and will, significantly, always result in either absolute failure or results that are far from ideal. To do so is an unprofitable use of your time and energy. As much as we would like to see a tropical climate in London in January, this will simply never occur. Some of us are entirely consumed in attempting to alter things outside our control. This state of being is undoubtedly tantamount to madness. The sadness is that many of these people are not aware that they are attempting to change something that simply cannot be changed. A classic example of this sort of maladaptive behaviour is the wish to change the behaviour of another person. In truth, it is all but impossible to compel a person to change his or her ways, no matter how hard you try. This sentence challenges you to examine the things in life that you can change. The magic word in this sentence is ‘can’. One significant thing you can change is yourself. Whilst change may take a lot of effort, determination and pain, positive transformation of yourself is definitely something that is within the realms of possibility. This reasoning is highly empowering and perhaps where the power of the Serenity Prayer is most apparent. Whilst personal change is possible, nobody said it is going to be easy. Change is usually difficult and even painful for most. Change almost always requires significant personal sacrifice in multiple areas of your life. Lasting change also requires substantial self-determination and self-examination. Many people lack the courage to carry out a thorough self-examination because they are afraid they may not like what they find. You must also refuse to allocate blame on external factors such as events or people. Doing so will typically mean you lack the courage to change the things you are able to influence in your life. Demanding a level of personal responsibility is about taking ownership of the things you are able to change. It’s about shifting the ‘locus of control’ inwards. Resentment towards others is one sign you are unnecessarily conceding control to outside forces. We feel personal change means you must take radical responsibility for all aspects of your life. This includes setting boundaries of what you will and what not accept from others. Doing so means you are able to enforce matters that are within your realm of control. In time, you will truly become your own master in ways that may seem entirely alien to you given your previous record in this area. Taking a radical level of personal responsibility has the potential to significantly alter your life’s course for the better. Altering your life’s course is not for the faint-hearted, and thus it is not surprising that the Serenity Prayer uses the word ‘courage’ in its text. Often, changing things within your power often results in either distancing yourself from or eliminating things in your life that you cannot directly change. For many, this last sentence of the Serenity Prayer is the most significant. Why? Because knowing the difference between what we can change and what we cannot is, in practical terms, never that straightforward. This may be because many of our decisions are driven by emotion rather than logic. This means most of us are guilty of trying to change things we are unable to change whilst neglecting the things that could actually make a difference. Perhaps this is because, at some deep psychological level, we are afraid to implement things that we know are capable of instigating changes to how we live our lives, even if those changes are well within our best interest. The old adage is true that people are generally afraid of change. Knowing this distinction between what we can and cannot change is often a prerequisite for enacting lasting positive change. It also allows us to focus our efforts on areas we are capable of influencing whilst allowing us to avoid wasting our precious time and energy on areas we are simply unable to change. The word ‘wisdom’ is akin to knowledge and experience. If you have faith, you will gain this wisdom with time. Reciting the Serenity Prayer will help to instil this wisdom into your thoughts almost unconsciously. We feel the word ‘wisdom’ is interchangeable with the word ‘ability’ or ‘skill’. Thus, it may be argued the Serenity Prayer isn’t so much a prayer but more a set of instructions for successful living. If you enjoyed the above, then you will likely also enjoy reading our guide to the history of Alcoholics Anonymous. We have also compiled a list of the absolute best Alcoholics Anonymous speeches. These pages are definitely worth bookmarking and sharing on your social media accounts!